I've also noticed my hands are looking older. Note to self: use sunscreen on hands. 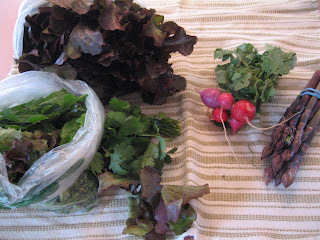 To eat everything we receive from the CSA and let no produce rot in the crisper. To eat everything from our garden. And if we can't eat it, either freeze it or give it to a friend, neighbor, or co-worker. I did not make good on that last bullet point. I'll keep trying! I'm also keeping track of what we spend on groceries (a recent mini-obsession of mine). We have a bi-weekly budget we *try* to stick to, but I haven't kept a close eye on what is being spent solely on food, until recently. Basically, I want to see if belonging to a CSA, tending a garden, and having a co-op membership will make a difference in our grocery budget. I like to buy organic groceries (and we're definitely on a budget), so I'm guessing these things together will have a positive impact (stay tuned). So far, we're on track for spending around $600 this month for a family of 4. It's not all organic, but that is my preference. Just curious...anybody keep track of how much they spend a month on groceries? For how many people? I'm not sure if $600/month for 4 people is insanely expensive, average, or below average. Let's compare...let me know what you think! I'm trying to be more watchful of waste as well (leftovers seem to be our downfall). I also budget $600 per month on food for a family of 4. That's usually our high amount, sometimes it's less. I think that since three of our family are home all day during the summer, this will be pretty accurate. This doesn't include non-food items like cleaning supplies, etc. I can really get my food costs low if I plan out the weekly meals on Sunday, based on what is on sale at the grocery store for the week. We then only go to the store once during the week. I don't always do that, though. It takes time! 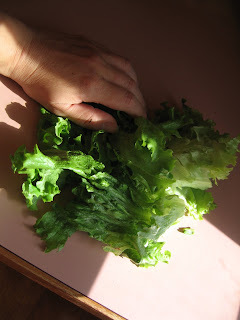 My kids eat lettuce, but we let them eat it with their fingers, like chips. They use ranch dressing as dip. We found that the mechanics of trying to stab lettuce with a fork was too much of a barrier, and not fun. Well, we are a family of 4, plus a nanny and we spend way more than that! I think you'd be surprised how much people spend, but they don't keep track so have no idea. My Taiwanese friend stir-frys lettuce, and I've seen it used to make broth. Since you get it anyway, maybe try cooking it differently. I'm not a big lettuce fan either, so I totally get it. Tip for all the green tops of radishes, carrots, etc. and any other greens you don't want to eat: If you have a friend who owns a rabbit, the rabbit would appreciate all those greens!